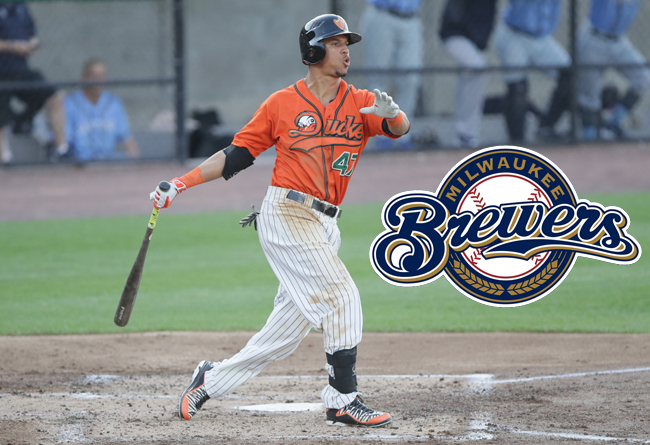 (Central Islip, N.Y., Aug. 17, 2017) – The Long Island Ducks today announced that outfielder Quintin Berry’s contract has been purchased by the Milwaukee Brewers organization. The former Major Leaguer will join the team’s Triple-A affiliate in Colorado Springs, Colo.
Berry played 27 games with the Flock and compiled 23 hits, nine RBI, 16 runs, six doubles, one triple and 12 walks. He also showcased tremendous speed on the basepaths, stealing 15 bases while being caught just three times. The 32-year-old had hit safely in each of his past six games entering play on Thursday, batting .333 (8-for-24) during the streak. Defensively, Berry did not commit a single error in the outfield. The San Diego native has four seasons of Major League experience, including one each with the Detroit Tigers (2012), Boston Red Sox (2013), Baltimore Orioles (2014) and Chicago Cubs (2015). He played 125 MLB games and compiled a .265 batting average with three home runs, 33 RBI, 53 runs, 10 doubles, six triples and 27 stolen bases. He also appeared in back-to-back World Series with the Tigers in 2012 and Red Sox in 2013, winning the title during the latter. Berry began the 2017 season with the Rochester Red Wings (AAA, Twins) of the International League. Berry is the third member of the Flock to have his contract purchased by an MLB organization or foreign professional club this season. He joins infielder Nate Freiman (Mexican League) and right-hander pitcher Tim Melville (Minnesota Twins). The Atlantic League has been a leader in professional baseball and a gateway to Major League Baseball since 1998. Over 37 million fans have attended Atlantic League games and more than 800 players and 50 managers and coaches have joined MLB organizations directly from the ALPB. The Atlantic League emphasizes winning baseball games, showcasing the talent of top-caliber players and offering affordable family entertainment to metropolitan markets serving nearly 15% of the US population.